The African clawed frog's ancestor inherited one set of chromosomes each from two different species and doubled its whole genome some 18 million years ago, according to an international research consortium led by Japanese and American scientists who sequenced the entire genome of the Xenopus laevis for the first time. Scientists hope that the finding will help our understanding of vertebrate evolution, as the vertebrate genome doubled twice 500 million years ago. X. laevis is unusual in that it is a tetraploid species that has four sets of chromosomes, while many organisms, including humans, are diploid and have two sets of chromosomes. How and when this came about has been a topic of debate for some time. One hypothesis is that the tetraploid X. laevis inherited one half of its genetic material from each parent when two diploid ancestral species mated, and the genome of this diploid offspring then doubled, giving rise to a tetraploid organism with twice the number of chromosomes as its ancestors. "X. laevis is an essential organism for biological and biomedical research, but the sheer size and complexity of its genome made it difficult for scientists to sequence the genome in its entirety," says Associate Professor Masanori Taira, leader of the Japanese research team at the University of Tokyo. He continues, "He thought that sequencing the entire genome would not only be valuable for biological and biomedical research but also provide clues as to the origins of tetraploidy." 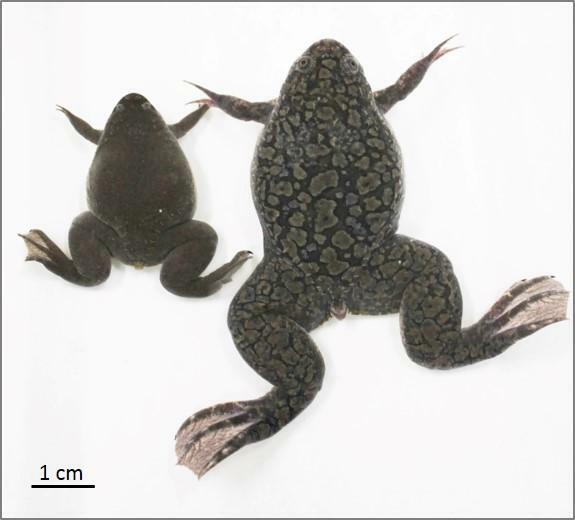 The researchers sequenced the entire genome of the J (Japan) strain of the frog inbred in Japan, in which the genetic codes inherited from the mother and father, respectively, are identical. The US team led by Dan Rokhsar and Richard Harland at the University of California, Berkeley, used the shotgun method to sequence short fragments of DNA and piece them together like a puzzle. The Japanese team sequenced very long fragments of DNA and determined the location of the long DNA on the chromosomes. This extra step helped to distinguish the separate genome sequences inherited from each ancestral species. "I thought that analyzing the 'transposable elements' (segments of DNA that move around the genome) that become fixed or inactive over time, might be one way of tracing the two ancestral genomes, present as subgenomes in X. laevis," says Taira. He suggested this idea to his co-authors, Dr. Akira Hikosaka at Hiroshima University and Dr. Yoshinobu Uno at Nagoya University. They tested Taira's idea and discovered that indeed two sets of chromosomes originated from different diploid ancestors. Curiously, the scientists also found that the subgenomes evolved separately in the nucleus, giving rise to shorter S and longer L types, the first evidence of animal subgenome evolution. The L type chromosomes preserved most of the ancestral genetic information, while the S type showed greater gene loss, deletion and rearrangement. "Scientists believe that two rounds of whole genome duplication 500 million years ago contributed to the emergence of the first vertebrate species and an explosion of diversity in this group. We think our discovery will improve our understanding of this important event in our evolutionary history," says Taira. Adam M. Session, Yoshinobu Uno, Taejoon Kwon, et al., "Genome evolution in the allotetraploid frog Xenopus laevis," Nature, 2016. U.S. National Institute of Child Health and Human Development through grants HD065705, HD080708, P41 HD064556, GM086321 DSR, RMH AMS, JBL.TM, SM and P41 HD064556 to Xenbase; Japan Society for the Promotion of Science KAKENHI Grant Numbers, 221S0002 (A.T., Y.K., A.F. ), 24590232 (S.T. ), 25440180 (A.H.), 15K14521 (M.K. ), 15K07082 (H.Ogino), 22570137 (T.T), 25460245 (A.S.), 23370059 (Y.I. ), 23113004 (Y.M. ), 25251026 (M.T. ), and 22127007 (N.U.). Additional support was provided by the UNIST Research Fund Grant Number 1.150094.01, 1.150043.01 and 1.160060.01 (T.K), U.S. National Human Genome Research Institute (J.S. ), the Hiroshima University Phoenix Leader Education Program (S.T. ), National BioResource Project of MEXT Japan (A.S.), the US National Institute of Health Office of the Director and US National Institute of Allergy and Infectious Diseases (M.F.F., Y.O. ), the US National Institute of General Medical Science (I.Q., S.H., J.B.W. ), the US National Science Foundation (NSF), Cancer Prevention Research Institute of Texas(CPRIT) and Welch(F1515) (E.M.M. ), the US NIHGM and NHLBI (J.B.W. ), and the Okinawa Institute for Science and Technology Graduate University (O.S). Work conducted by the U.S. Department of Energy Joint Genome Institute is supported by the Office of Science of the U.S. Department of Energy under Contract No. DE-AC02-05CH11231 DSR AMS, JAC, UH, SS, JC, JJ, JG, JS; J.K. was supported by an NSF graduate research fellowship, and A.M.S. was supported by a NHGRI Training Grant. Grant R01HD069344 to GJCV.